Secondary benefit of having our house on the market: I’m getting kicked out of the house for an hour every couple of days. At first this seemed like it was a bad thing. I’m trying to work here! How could I just get up and leave for an hour? How disruptive. How annoying. The first time we had prospective buyers, I worked from my car around the corner. But because Matt often has the car during the day, I’ve had to come up with an alternate plan. 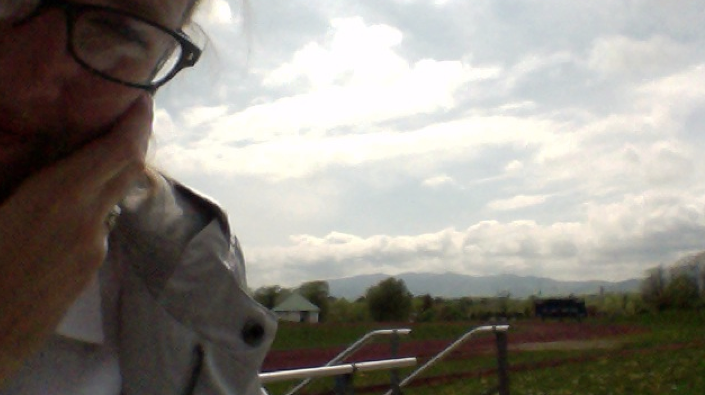 Lately, I’ve been spending my hour on the bleachers at the college track, which is just a couple of houses away from us. Turns out: this is a fantastic way to spend an hour. I have my computer, I have my phone, and when it comes to work, I’m doing exactly what I would be doing if I were still in my office at home. But the sun is shining and there’s a nice breeze. It’s quiet except for some birds and the sound of a lawnmower, which is far enough away to be a reminder of spring and not a giant nuisance. The view from my remote remote office is above. Not bad, right? This is solving a problem that I’m usually lazy enough to ignore. One of the dangers of working from home is that you can easily sit down at your desk at 8:00 in the morning and not look up again until the sun has set. There have been times when I’ve gone outside at the end of the day to find that it rained or snowed without me even noticing it. (No wonder my vitamin D is low.) When it’s -20 outside, I don’t think this is such a bad thing. But missing a long-awaited spring day is tragic. So it turns out that being kicked out of my office actually means that I’m kicked outside and I love it. I think I may institute an outdoor work period even if we sell the house. As I incessantly mention to anyone who will listen: Vermont winters are long. Wimpy people like me should be spending every possible minute out in the world while it’s reasonable to do so. Working or not. May 10, 2013 by Katie J.
I just hope you do not get kicked out minus a car during a downpour.